ALTAMIRA, Brazil, Apr 01 (IPS) - The Juruna indigenous village of Miratu mourned the death of Jarliel twice: once on October 26, when he drowned in the Xingu River, and the second time when the sacred burial ground was flooded by an unexpected rise in the river that crosses Brazil's Amazon region. Their cries are also of outrage against the Norte Energía company, the concession-holder for the Belo Monte hydroelectric dam, which determines the water flow in the Volta Grande stretch of the Xingu River, a 100-km area divided in three municipalities, with five indigenous villages along the riverbanks. Jarliel Juruna, 20, was very good at what he did: catch ornamental fish, which have been increasingly scarce since the dam was inaugurated in November 2015. Apparently the need to dive deeper and deeper to find fish and help support his family contributed to the fatal accident, according to his siblings Jailson and Bel. The company had ensured that the rise in water level in that area would be moderate, since the flow was divided between the Volta Grande and a canal built to feed the main Belo Monte generating plant, near the end of the curve in the river known as Volta Grande or Big Bend. The markers showing how high the water would rise were surpassed early this year, due to heavy rains and a limited diversion of the water to be used by the hydroelectric plant, which will be the third largest in the world in terms of capacity once it is completed in 2019. The unexpected rise also caused material losses. Boats and equipment were carried away by the high water. "My manioc crop was flooded, even though it was on land higher than the markers," said Aristeu Freitas da Silva, a villager in Ilha da Fazenda. Despite the excess of water, this village of 50 families is suffering a lack of drinking water. "The river is dirty, we drink water from a well that we dug. The three wells drilled by Norte Energía don't work because the water pump broke eight months ago," said Miguel Carneiro de Sousa, a boatman hired by the municipality to ferry students to a nearby school. The school in Ilha da Fazenda only goes up to fourth grade, and in Brazil education is compulsory up to the ninth grade. Deiby Cardoso, deputy mayor of Senador José Porfirio, one of the municipalities in Volta Grande, admitted that water supply is a municipal responsibility, and promised that the problem would be resolved by late April. He did so during a Mar. 21 public hearing organised by the public prosecutor's office in the city of Altamira, to address problems affecting Volta Grande. IPS attended the hearing as part of a one-week tour of riverbank and indigenous villages in this area. Taking over the Xingu River for energy purposes, to the detriment of its traditional users, such as indigenous and riverine peoples, has cost Norte Energía many obligations and complaints in its area of influence in the northern state of Pará, where local people sometimes confuse its role with that of the government. The company is required to carry out a plan for compensation and mitigation of social and environmental impacts, with conditional targets, and the number of complaints about non-compliance is increasing. 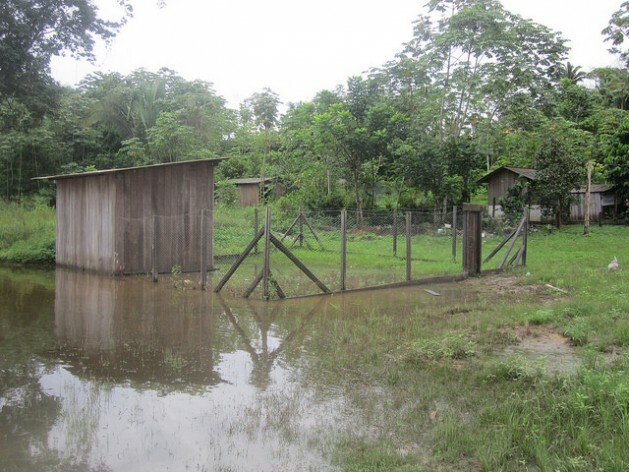 Local residents of Ilha da Fazenda had reasons to complain at the hearing. The health post is filthy and abandoned, the ambulance boat has a broken motor, and the electricity produced by the village generator is only available from 6:00 to 10:00 PM. The deputy mayor accepted the complaints about the delays, which he said were due to the short period that the municipal government has been in power, since January. But holding the key to the Xingu River, opening or closing spillways and activating or shutting off its turbines, Norte Energía dictates the water level downstream, especially in the Volta Grande. At the hearing, it seemed clear that they do it without considering the human and environmental impacts. "The water level drops and rises all of a sudden, without warning," complained Bel Juruna, a 25-year-old community leader and defender of indigenous peoples' rights who talked to IPS during the visit to the village of Miratu. "These abrupt fluctuations in the volume of water released in the Volta Grande produce changes in the water level in the river that confuse the aquatic fauna, disoriented by the availability of space to feed and breed," said ecologist Juarez Pezzuti, a professor at the Federal University of Pará. And once the hydroelectric plant starts to operate normally, the water flow will be permanently reduced, he added. The local people are informed daily, through phones installed by the company in many houses, about the volume of water that enters Volta Grande. But this information about cubic metres per second means nothing to them. "The information has to be useful," adding the water level in the river in each village, the local indigenous people told the authorities present at the hearing, who included prosecutors, public defenders and heads of the environmental and indigenous affairs agencies. There is a "failure of communication" that Energía Norte needs to fix, it was agreed during the hearing, where there were no representatives of the company. Safety of navigation is another demand by the Juruna and Arara native people, who live on the banks of the Volta Grande. The damming of the river exacerbated the "banzeiros" (turbulence or rapids), which have already caused one death, early this year. The local indigenous peoples are demanding large vessels, one for each of the five villages, to cross the reservoir to Altamira, the capital of the Medio Xingú region, without the risks that threaten their small boats. They are also asking for support equipment for the most turbulent stretches of the Volta Grande, from August to November, when small dangerous rocky islands emerge due to the low water level. The reduced water flow has made navigation difficult in the Volta Grande, the traditional transport route used by local people, increasing the need for land transport. An access road to the routes that lead to Altamira is a chief demand of the Arara people. "It was a condition of the building permit for Belo Monte, to this day unfulfilled. We have been waiting for that road since 2012," protested José Carlos Arara, leader of the village of Guary-Duan. They rejected the handing over of a Base of Operations that Norte Energía built for the National Indian Foundation, the state body for the defence of indigenous rights, to protect their territory. "With no land access, we won't accept the base, because it will be incomplete," said Arara, supported by leaders of other villages. To improve territorial protection and the participation of indigenous people in the committees that deal with indigenous issues and those involving Volta Grande within the programmes of compensation and mitigation of impacts of Belo Monte is another common demand, submitted to the hearing in a letter signed by the Arara and Juruna people. The need for protection was stressed by Bebere Bemaral Xikrin, head of the association of the Xikrin people, from the Trincheira-Bacajá indigenous land. Since mid-2016, the waters of the Bacajá River have been dirty, which has killed off fish. The reason is the "garimpo" or informal surface mining along tributary rivers of the Bacajá, on the outskirts of the Xikrin territory. And things will get worse with the construction of a road to bring in machinery for the garimpeiros or informal miners, if the Protection Plan, which was to be ready in 2011 "but hasn't made it from paper to reality, is not fully implemented soon," said Bebere Bemaral. The Xikrin people do not live along the Volta Grande, but everything that happens in that stretch of the Xingu River affects the Bacajá, a tributary of the Xingu, which this people depend on for survival, he explained. The rivers which were the lifeblood of local indigenous and riverine people became a risk factor with the implementation of a hydropower megaproject, to which could be added the Belo Sun mining project, also on the banks of the Volta Grande.